I think I’ll break my Facebook “fast” to say a few words about Dad. He died 5 years ago today, as Dixie mentioned earlier. I’ve never been one to miss people all that much, even those dearest to me. I don’t know why. I sometimes wonder if there’s something wrong with me. But that’s one reason I didn’t think to say anything on Facebook. But I do think about Dad from time to time, particularly around this time of year: his birthday in mid-April and his date of death just over a month later. Several of you said very kind and true things about my Dad in comments on Dixie’s post today. Thanks for that. It’s interesting how even the not-so-great memories of people will, with time, start to develop a sheen of sorts. Remembering seems to rub away the spots of corrosion and rust and leave polished metal underneath. I remember him saying that, but I don’t remember the twinkle in his eye. I just remember feeling mildly uncomfortable because it made no sense to sense to any of us (or at least I thought not). It was just another weird saying that my grumpy, gruff Dad would randomly lob at people. But now, all these years later, I think it’s hilarious, even though the phrase still doesn’t really make sense to me (or maybe it’s just starting to make sense), because that phrase is just so Dad. I wish I could remember some of his other turns of phrase. But Dixie and I do carry some of them forward into our own family. Some of them we share just with each other. We will imitate him from time to time. We will say, “I like that pie,” when eating a delicious pizza. Or we will refer to that ubiquitous Seattle coffee company as “Starbuck” without the “s” at the end. And when we go for a walk, we’ll say it’s to “blow the stink off.” Those are all Dad-isms. Maybe it’s not that I don’ t miss people, but that I don’t take enough time to think about them—to really think deeply and remember—because I really do miss Dad. This entry was posted in Family, Musings and tagged Dad, Family, memories on May 23, 2016 by Marc. Last year at this time Dixie and I would have been in the middle of our dinner at the St. Paul Hotel (?). We would have already seen Wallace Shawn walk in and out of the restaurant and I would have already spilled most of my glass of wine into the purse belonging to the lady at the table next to ours. We would have been in St. Paul for 24 hours or so already, having had breakfast at Mickey’s Diner and done some shopping at the Mall of America, and been in the audience for this episode of A Prairie Home Companion. That weekend has quickly become one of my favourite memories–one of those special moments that will forever have a warmth to it as it comes to mind. I have a number of these moments, all of them occurring during my married years, so they are all Dixie and me and sometimes the kids. There was the Thanksgiving weekend with Dixie’s family, including Granny and Grandpa, at the cabin on Christopher Lake. It was a beautiful cool-but-not-cold autumn, the aspens still holding on to most of their bright yellow leaves, but the musty smell of drying and decomposing leaves nevertheless filling the air. We’d go for sauntering walks on the ski trails nearby, grandpa too. We’d snooze on the deck overlooking the lake. We’d play games. There was the weekend Dixie and I spent at the mineral spa in Manitou Beach. The mineral spa wasn’t all that impressive (floating around in extra buoyant water is only interesting for so long). 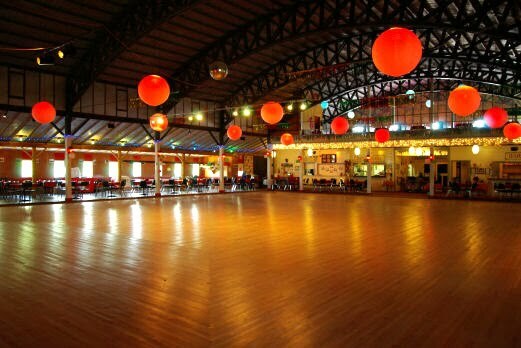 However, the Saturday night of that weekend we went to Danceland, famous for one of the last original hardwood-on-horsehair dance floors. We spent the evening dancing polkas and the charleston and a number of other styles. The lighting, the general atmosphere, the dancing in the crowd of mostly seniors and retirees. Something about that evening was magical and it remains with me as one of those moments. 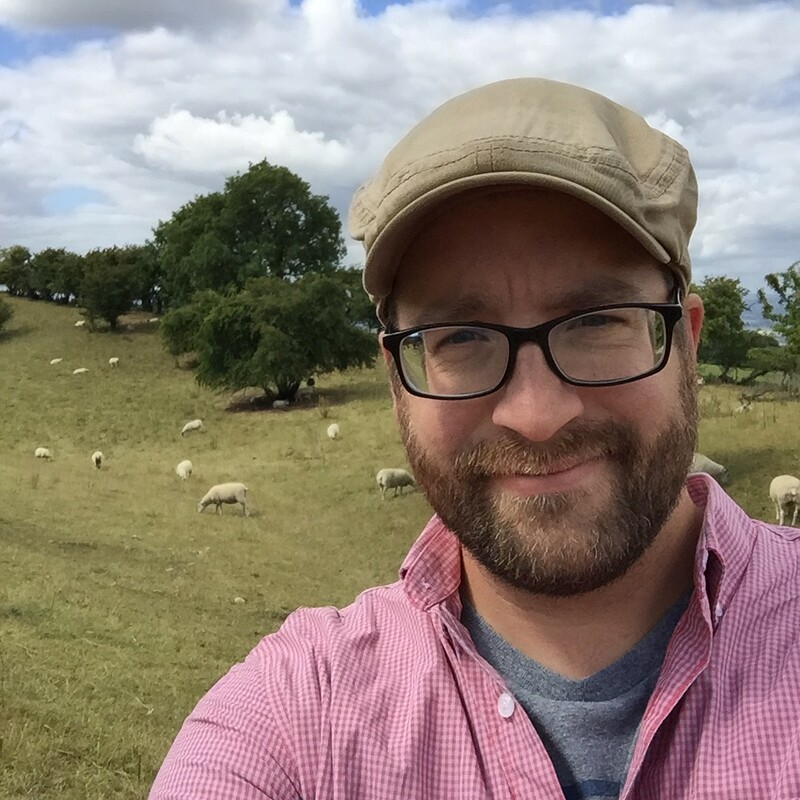 There were particular locations in our 10th anniversary trip to England–our London hotel, early morning market in Oxford, cream tea in Lyme Regis. There are others I’m sure that aren’t coming to mind at the moment. Memories that stick with me in a way that other memories do not. And as much as I may want to recreate that experience, as much as I wish I could do that again, these moment can never be truly recreated. Having been done before, they will already have lost that edge of newness, and expectation–something that wasn’t there before these moments were experienced the first time–tends to undermine the effort of recreation. That’s what makes these moments special I think–because we don’t see them coming. They just happen and until you’ve experienced it you won’t know that it’ll be one of those moments. I’ve marked this date in Google calendar for every year in perpetuity. It’ll send me an email reminder every year at this time. And every year around September 24, I’ll listen to a recording of that show and I’ll think of our time together in St. Paul, Minnesota. The show, the diner, the Italian bistro around the corner from our hotel, Garrison Keillor’s bookstore in the basement of a building up the hill and beyond the Anglican cathedral. The memory will stir feelings deep inside me, and I will think of that time with joy and fondness and also a bit of sadness, because as beautiful as that memory is, that moment can never be relived outside of my memory. But that’s probably a good thing, I guess. That moment is probably best as a memory. Memory has probably shaped in a way that may not even reflect the reality of the moment–or perhaps it’s not that it has been reshaped, but that memory has teased out the things that one doesn’t catch in the moment. Quiet now… Garrison is singing. This entry was posted in Musings, Travels and tagged memories, Musings, Travels on September 24, 2012 by Marc. IT’S A FACT: “The Pink Panther Theme,” by Henri Mancini, is probably my favourite song of all time. I don’t know why this is, exactly, but it has been my favourite since childhood. It evokes feeling of nostalgia, a mysterious sense of Europe and my childhood, a sense of intrigue and adventure and fun. None of these things do justice to what I feel whenever I hear the song. I can’t quite find the words. This goes back to early childhood–perhaps even back to when we still lived in the Netherlands. Every so often one of the original Pink Panther films would be played on TV and a number of times I caught it at just the right time to catch the opening sequence, which included the theme song and a short animated feature with the pink panther and the inspector chasing him down. These short cartoons delighted me. It was always a let-down when the actual, live-action film began. At the time, I didn’t find Peter Sellers’ Inspector Clouseau very funny at all, and there was no pink panther, other than a mysterious jewel! Since that time “The Pink Panther Theme” has filled me with warm, happy feelings. I’m having some issues finding one I can embed, so here’s a link to a live version (with Mancini on piano) on YouTube. This entry was posted in Arts & Entertainment, Musings and tagged Mancini, memories, music, Musings, nostalgia, Pink Panther on April 29, 2011 by Marc. Today I went through my box of things kept since childhood. Or, rather, it is a box of my things which mom kept for many years and then passed on to me. Lots of stuff in there: a wooden race car my dad and I made and the trophies we won for both the speed of the car and its design; my old Stockade (Boys Brigade) badges; my swimming lesson patches (I got my white! ); a small collection of ugly keychains; the “C” (for Cougars) which would have gone on a varsity jacket, had I purchased on; old, non-specific hockey trophies (e.g. “Pee-Wee -A- 1st Place” — no date or location) and medals (two for Most Improved Player! ); old yearbook pictures of friends and of me, etc. As you can see, my yearbook pictures got progressively worse. Glasses, which I got early on, did not help a thing. The first picture was taken in October, 1985, just a couple of months after we immigrated to Canada. I was nearly 8 years old, and I was quite cute then, if I do say so myself. Then I got glasses. The second picture was taken in the fall of 1990–grade 9. Judging by my attire, I must have forgotten that it was yearbook picture day. The last picture is undated, but can’t be more than a year or two later. Acne is present on the chin. The truth is, my yearbook pictures were rarely acceptable. I recall my mom ordering only 2 sets of yearbook pictures in 12 years and looking at these, I don’t blame her. Early on, I tried getting away with not wearing my glasses, but my mom insisted I wear them, as she also did for my hockey pictures (even though I didn’t wear my glasses when I played), because I was a person with glasses–they were part of me. For some reason, I kept every single birthday card, postcard, letter, etc. I received between approximately 1979 and 1992. I’ve been carrying them around in a bag from apartment to apartment and house to house. Today I threw most of them out–I hadn’t looked at them in years. Dixie’s wondering if I shouldn’t keep some of them–they’ll be interesting in 20 years. It’s extra bulk, but there’s room in the box of my stuff, so I may have to take some of them out of the recycling bin. For probably a decade of birthdays, if not more, this was all she wrote on the birthday cards she sent me. “Oma.” I never resented this–after all, we’ve always lived at least 3,000kms away from Oma, so she didn’t know me all that well. In fact, over time it became rather endearing. I looked forward to receiving the card which would predictably say so little. That was just Oma’s way. I don’t remember her as a particularly affectionate person (other than the times as a child I was forced to kiss her prickly face); Opa was the affectionate one, but he died when I was quite young. 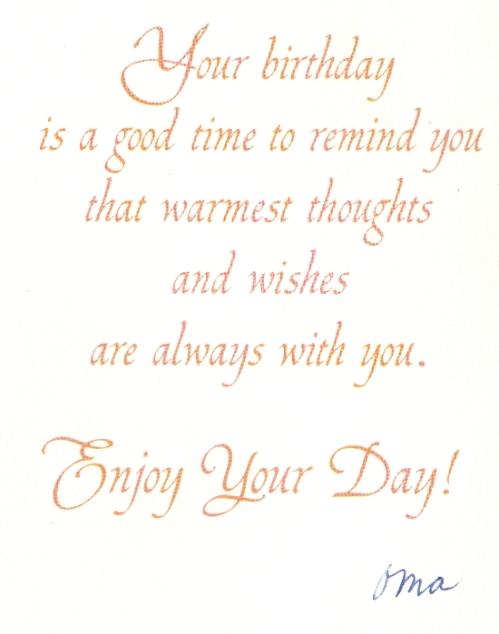 I was surprised, then, to discover that as I move back in time in Oma’s birthday cards that more would be said. Some said, “I love you. Oma.” And then there were a few that said simply, “Opa en Oma”. Further back still and the cards would have a paragraph two of writing. It occurred to me today as I was looking through these cards that Oma said less and less as time went on probably because I never wrote her back. I don’t blame her. It’s great that you will be coming to our school! We will be expecting you on Monday, August 20 at 8:30a.m. You will be in Meester de Jong’s class. 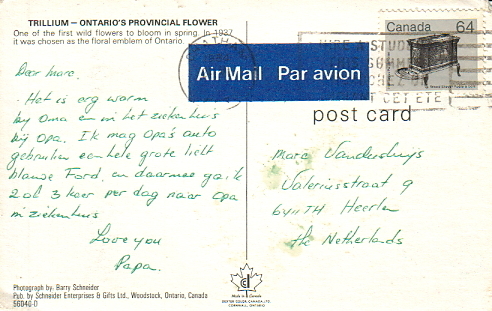 This is the back of a postcard from my dad, postmarked in Chatham, Ontario in 1984. Dad was visiting Opa in the hospital in Canada, after Opa had a stroke. (Opa would die in that hospital bed 9 years later). It is very warm at Oma’s place and in Opa’s hospital. I may use Opa’s car–a really big, light-blue Ford–with which I go to Opa in the hospital 2 or 3 times a day. On the right is what used to be our address in Holland. Note that my last name should technically be spelled “Vandersluÿs”. Until recent years, Dad had excellent penmanship. Green was his ink colour of choice. He used to be left-handed, but that was in the days when left-handedness was frowned upon, so he was forced to learn to write with his right-hand. She made it out to “Whomsoever”, which I think is hilarious. I’m not sure what happened there–perhaps I had forgotten about Valentine’s Day until the night before, so Mom had to fill them in for me after I went to bed. 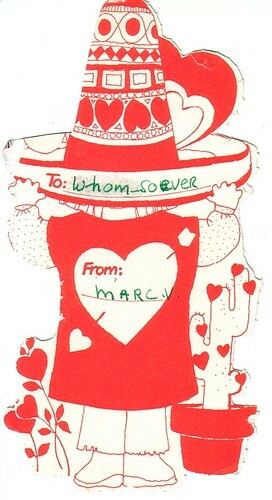 Or maybe I just had extra cards and Mom filled it in just in case “Whomsoever” was left out. Evidently, I never gave it to anyone. It’s home-made, printed on a dot-matrix printer. They may have done the home-made thing to save money, but there’s not a spot of red on it, which is unusual for a valentine, but I imagine the text would have been illegible on red paper. I recall that we weren’t the kindest to her. We’d say this: “This is Virginia. We call her ‘Virgin’ for short, but not for long!” and then we’d laugh and laugh, even though we didn’t know what the hell we were talking about. Kids can be cruel. 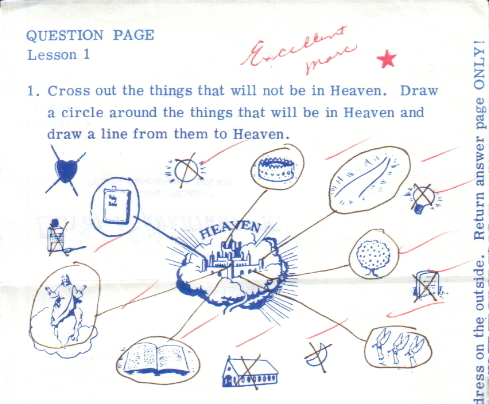 This lesson is probably from about 1988. Apparently my effort was “Excellent” and deserving of a red star. I wonder what kind of comment I would have received had I circled, say, the gravestone or crossed-out Jesus. I meant it, too. “Sexually pure” is a frustratingly vague term which mystified me through my adolescence. Actually, it still mystifies me, but now I don’t have to worry about it so much any more. Non-specific terminology aside, I say with confidence that I was a virgin when I got married. Make of that what you will, True Love Waits. Also kept: a floppy disc labelled “PC-WRITE MASTER”; a paper boat I made and named “The Jolly Cow”; a card for my 17th birthday, from my friend in Holland. He wrote, “PS I don’t know what the card means exactly, but I did like it.” I probably didn’t know what it meant at the time either, but reading it now I think I do. If we knew then what we know now, he probably wouldn’t have chosen that card to send me. The box also contained a large rock collection. Some of them are my brothers, but most of them were found/acquired by me, including a rock picked at the Columbia Ice Field, smoothed over by the retreating glacier, a piece of the Berlin Wall (not acquired personally), and numerous rocks with small fossils in them. As memory serves, I was quite adept at spotting befossiled rocks. And that’s today’s trip down memory lane. Now to decide what to do with a decade’s worth of birthday cards. 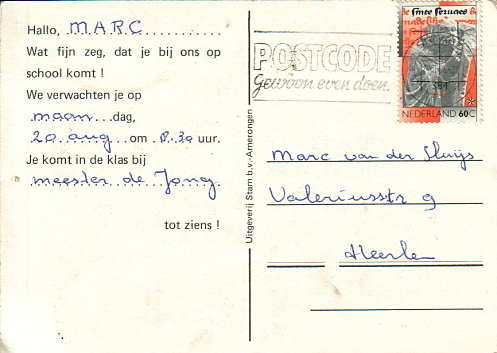 This entry was posted in Family, General and tagged Family, kept things, memories, nostalgia on August 15, 2009 by Marc. I read in the PassPort, the Briercrest alumni rag, that Barkman Arena in Caronport is up, running and officially opened. In some ways I want to say, “It’s about time.” They were talking about a new hockey arena when I was in high school–someone had already started fundraising at the time and it looked like I might even play hockey in the new rink, but things fell through. But good for them for getting it up and running. Sparrow Gardens, the hockey rink in which generations learned to play hockey, has seen better days. It’s old, dusty, cold, and the ice is not regulation size. The PassPort said that it is to be torn down this month, which I noted with a bit of sadness. That’s less than half of the building, but it’s the rink portion. It’s a converted airplane hangar from the days when my hometown was a RCAF training base. It’s one of the few remaining RCAF buildings in town. And it’s filled with memories. When we moved to Caronport from the Netherlands in 1985, we lived in “the hangar”–we never called it “Sparrow Gardens”, a name which I think was given to it to try to make less what it is (that is, old, dusty, ugly) during conferences and youth events–although sparrows did fly around in there. We always called it “the hangar” or simply “the rink”. In the picture you’ll notice portions of the building jutting out, with lower roofs. I imagine that back in the RCAF days they housed offices and machine shops. The portions in the picture are now dressing rooms. However, further back on this portion of the building as well as to the right, those jutting parts were, in 1985, apartments in which student families lived, and they looked the same as they do as the portions in the picture (except they had the old RCAF windows in them). We lived in two different apartments in the hangar in our first two years in Caronport. My best friend at the time (James D., are you out there somewhere?) also lived in the hangar. The first apartment we lived in was right next to the rink and my bedroom was on the inside wall of the apartment, so some nights I went to bed to the sound of pucks hitting the wall and the mesh covering the window. I don’t remember this, but my mom often recalls a story from our first winter in that apartment in Caronport. I would have been 7-turning-8. It was during the first major snowstorm–cold, big snow drifts, white-outs. My dad would have been familiar with them from his days in Caronport in the late ’50s and early ’60s, but for my mom, who had always lived in relatively mild winter climates, this was completely new and terrifying. And it just so happened that during that snowstorm I didn’t come home when I was supposed to. My mom immediately had mental pictures of me frozen in a snowdrift somewhere in the village and both she and dad walked into the storm to look for me, calling my name. But they didn’t find me. I don’t know what brought it to mind to look where they did–desperation, I suppose–but they found me sitting in one of the dressing rooms with one of the local hockey teams. I had never left the hangar and had simply lost track of time. In later years, Christmas holidays–two, three weeks?–would be spent mostly in the rink. Many of the kids and some of the adults who were still in town for Christmas would be at the rink first thing in the morning and play shinny all day–maybe stopping for lunch, but then rushing right back afterwards to keep playing. Those were great days. Looking back, it’s strange to think of the people who joined us to play. We had children and adults playing at the same time, people who played very well (I believe Ryan Smyth may have shown up once–he used to play for our high school team) and people who could barely skate. Even the president of Briercrest Schools (Dr. Barkman himself) came out every now and then (he was among the very good players). Christmas holidays in those days were about all-day pickup hockey, until one year some parent complained that there was no free skate time for the figure skaters and non-hockey players. So rink officials stepped in and gave them their timeslot as well. Picture in your mind 15 or 20 hockey players of various ages, sticks and skates in hand, standing on the bleachers watching one or two little girls twirling around the rink, waiting for them to be done their one or two-hour time-slot. It was an injustice. In the summer, the hangar was a cool refuge from the dry, 35-degree weather. And there were no grasshoppers there. The summer of ’85 was the worst year for grasshoppers I’ve ever experienced. I would step near a 6″x6″ patch of grass and what would seem like hordes of grasshoppers would jump up and buzz around me, crawl on my shirt. I had never seen such a creature before. I was terrified. But they didn’t go in the hangar. Too cool, maybe. The hangar was dusty and a little damp, too, as I recall. It was filled with all kinds of interesting nooks and crannies–places kids would climb into, passages under the floor connecting the hangar to different parts of the old air base. Rumour had it that some of those nooks and crannies had rat poison in them, but I suspect that was said to keep the kids away. I never saw a rat in the hangar. But it was probably not the healthiest place to spend summer days. I remember mom telling us to go outside all the time. Being out of the apartment but inside the hangar didn’t count. Back in the day, Caronport, being a “Christian town”, banned trick-or-treating and legend had it that on All Hallows’ Eve, Satanists from Moose Jaw would come into town and do all kinds of Satanisty things. Nobody ever explained what sorts of things those would be–we never found skinned cats or any other such rumoured-to-be evidence of Satanist activity. Except for the one year that a couple of friends found what appeared to be a pentagram drawn in chalk underneath the old wooden bleachers in the hangar. In chalk. We all bought it and were creeped out. In later years, the apartments in the hangar were converted into more dressing rooms and weight rooms. And now it is going to be torn down. But, if I may speak sentimentally for a moment, I hold onto the memories. I hope to get out to Caronport this summer or maybe next, just to wander around the place again. This entry was posted in General, Musings and tagged Caronport, Childhood, hangar, hockey, memories, nostalgia, rink, Sparrow Gardens on June 6, 2009 by Marc. Took the kids to Kidsfest today. Well, Dixie took them and I met up with them there. I hate to be Mr. Negative, but most of the time there was spent waiting. 20 minutes in line for cotton candy and popcorn; 20 minutes in line for inexplicable balloon hats; 5 minutes in line for the bouncy castle; 3 minutes in line for hot dogs (which, at $0.50 apiece, with $0.25 soft drinks, was actually quite the steal of a meal); 10 minutes in line for face painting. So, out of the 1.5 hours I was there, 1 hour of it was spent waiting. Wow. I hadn’t put the numbers together like that until just now. But the kids had fun. I guess they played some games before I got there. And they jumped in the bouncy castle. And they got a hug from a snake. And they got their faces painted. And they got cotton candy, hot dogs, candy, pop corn and balloon hats. Can’t really complain, now can we? Not sure what was going on with the face painting. The first girl available to paint the kids’ faces didn’t look to be much more than a couple of years older than Madeline, but she had a volunteer shirt on, so . . . Madeline’s face turned out fairly well. Luke’s, on the other hand, looked a little like the paint was discharged from a shotgun. But he’s young enough for it to not make a difference. His face was painted and he was happy. Had it not been painted, he would have been happy too. In Holland, when I was the kids’ age, they would have a carnival in a field a block away from our house. Do you know what I remember from those carnivals? The smell of cigarettes and the Heineken beer coasters from the beer tents. That is all. This entry was posted in Family and tagged Family, fun, memories, the kids on July 17, 2008 by Marc.